US Markets were off to a bit of a slow start this week as investors awaited the final report from the FOMC meeting. However, the Federal Reserve has come to their conclusion and it seems to be exciting news for investors. 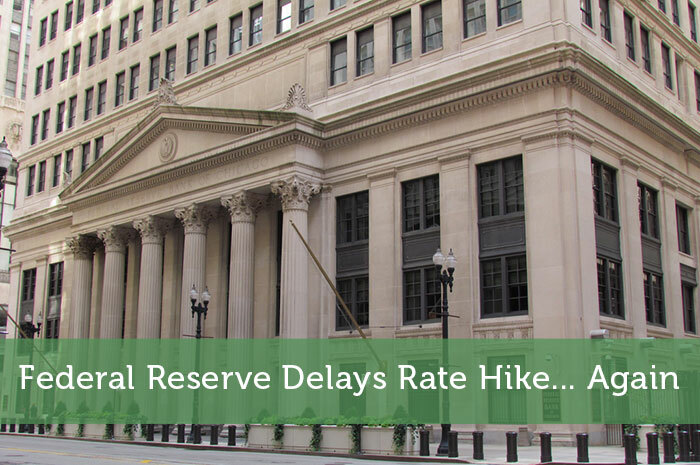 Essentially, the Fed has made the decision to delay the increase of their interest rate. Today, we’ll talk about why investors care so much about interest rates, why the Fed can’t quite raise its rate yet, and what we can expect to see from the market moving forward. The Federal Reserve’s interest rate plays a key role in market activity. That’s because of what the rate represents. Essentially, The Fed’s rate, known as the Federal Funds rate, is the rate that banks pay in order to borrow money. In an attempt to turn a profit, banks borrow the money from the Federal Reserve and lend that money to consumers with a mark up on the interest rate they are paying. With that said, when the Federal Reserve’s interest rate is low, banks pay less money to borrow money. These savings are passed down to consumers. Adversely, when the Federal Reserve’s interest rate is high, banks pay more money to borrow, passing the added cost down to consumers. Therefore, under low interest rate conditions, which we are currently seeing, consumers spend less money on interest. This means that they have more money available to spend on products and services, which in turn lends a hand to corporate earnings and excites investors. If the Federal Reserve was to increase its rate, consumers would be forced to spend more money on interest. This would ultimately put a drag on corporate earnings and cause resistance in the market. Therefore, investors are happy overall with the Federal Reserve’s decision to keep its low interest rate unchanged. As mentioned above, low interest rates are a good thing for investors. Therefore, as we would imagine, US markets reacted in a positive way. Yesterday, the Dow Jones Industrial Average, NASDAQ and S&P 500 all ended the day with notable gains. However, today, the story seems to have changed. At this point, it seems as though investors are realizing why the Federal Reserve decided to keep rates unchanged. This is leading to a new level of concerns for investors. After all, the ultimate reason was poor economic conditions, which are also likely to weigh heavy on the market. Here are some of the larger factors that likely played a role in the Federal Reserve’s decision to keep its low rate unchanged. Global Economic Concerns – The global economy has been a big area of concern for economists looking into the strength and stability of the United States economy for quite some time now. Unfortunately, global economic conditions aren’t getting any better. In fact, China just reduced its interest rate for the sixth time and Europe is considering more stimulus to pick up their economy. As a result of poor economic conditions around the world, exports are struggling, leading to problems here in the United States. New Home Sales – Recent reports show that new home sales are really starting to decline in the United States. In fact, in the month of September, this figure declined by 11.5%. This is also bad news for the economy because consumers only tend to buy homes when they are certain that they will be able to fulfill the obligations associated with their purchases. That means that when new home sales are down, consumer sentiment with regard to economic conditions is also poor. Jobs Reports – Another major factor weighing the US economy down is job additions. In both August and September, the United States seems to have stalled with regard to jobs growth. Based on the reason for the stall, I’m expecting to see bad news from October’s report as well. As a result of poor economic conditions, investors are getting cold feet. This is ultimately dragging market values down. Unfortunately, I’m expecting to see a continuation of bad news from the market, at least in the short term. The reality is that economic conditions are poor, and under poor economic conditions, we can’t expect to see overwhelmingly positive activity in the market. Where do you think US markets are headed and why? Let us know in the comments below!